SOMETIMES, just as a sense check, it’s good to reflect on how others see us, and right now Europe is seeing us through tears of laughter. The Tory Brexit shambles stutters on. And it is now abundantly clear after Theresa May’s latest hapless outing in Brussels that when we leave the EU on March 29th next year – and that is the only thing she seems sure of – it will be the most gratuitous act of national self-harm that any prime minister could inflict on her people in the disingenuous name of democracy. Indeed, the only take-away from the EU summit that had previously been billed as the historic moment when a deal would ultimately be sealed was the cold one that May was forced to eat alone in her room while the other leaders went out on a pub crawl. With just five months to go, there remains a fundamental sticking point – how to keep the border between Northern Ireland and Ireland free and open. 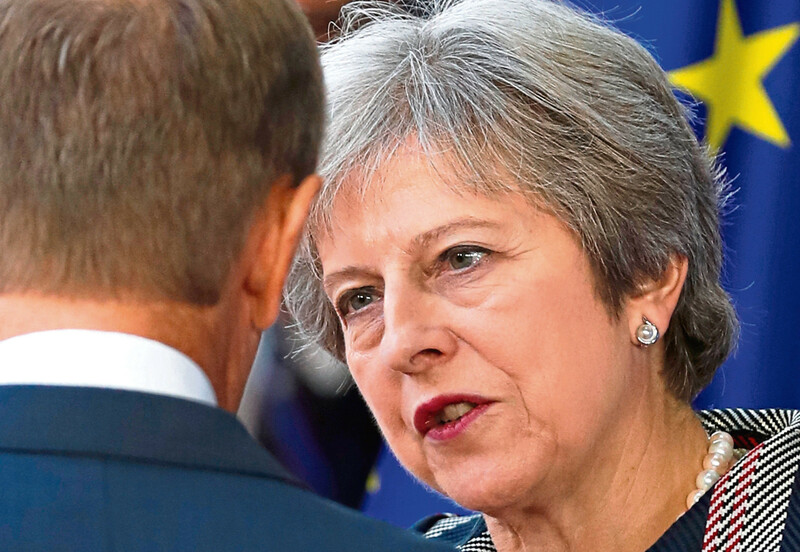 And the dilemma at the heart of May’s Brexit nightmare is, and has always been, the need to strike a deal with Europe that she could agree back home; with parliament, with her party and with the DUP, on whom her government relies. It is perhaps no surprise, then, that when she makes progress on one score she loses on another. It’s a circle she simply cannot square. We now know, though, that the EU27 has rejected her Chequers Plan. That’s gone. And the best that can be said of what she achieved last week was a potential extension on the transition period. We are about to fall from the plane without a parachute and May has just asked if the fall could take a little longer! The very idea that Britain would remain any longer within the EU, abiding by its rules, paying into its coffers and, in the words of Jacob Rees-Mogg, be that vassal state, has prompted uproar among the Brexiteers. But, worse, has brought May dissent on yet another front – the Scottish Tories. Already angered by the prospect that there could be any deal in which Northern Ireland enjoyed a different EU relationship to the rest of the UK, given the clear implications for Scotland, Ruth Davidson’s party has made clear that it would not countenance any delay to leaving the Common Fisheries Policy. That’s not about ideology, it’s about political self-interest. Davidson simply cannot go into the 2021 Scottish Parliament elections campaigning against the SNP and a second independence referendum in which she would claim that the nationalists “would drag Scottish fishermen back into the CFP”, when her own party has already left them languishing there. So, now the prime minister doesn’t just have the Northern Ireland MPs to appease, she has upset her Scottish contingent, too. For a party that prides itself on upholding the Union, she is making a jolly good fist at tearing it apart. And in this context, there was surely a rich irony in watching the SNP leader speak at an event in London urging the leader of the Conservative and Unionist Party to adopt an approach aimed at unifying the whole of the UK in response to Brexit.